The concept of an album has been for a long time, one of the most solid and reliable notions within the music industry. An album is what you work towards as an artist and it’s meant to be what represents your music in its most true form. Looking at the long-playing format in that regard, it’s kind of strange that we expect club-focused electronic artists to turn out albums that contain more ambient and abstract work than their previous releases and that, in turn, an album from a house or techno artist has to stray away from their sound and embrace a more pensive one. Expanding one’s sound isn’t a bad thing and should never be frowned upon; for artists to do so is a gutsy move that should be acknowledged, especially if it’s done well. With that said, when an artist sticks to their guns and embraces the dancefloor in an extended format, why should we take that away from them? Surely, they can co- exist?Enter ‘Wet Will Always Dry’, Blawan’s latest LP, released on his Ternesc label; an eight track record full of the storming industrial techno sound he has cultivated over the years. While it has and always will remain a tough task to fully encapsulate Blawan’s sound in a series of words, his album does a much better job of perfectly capturing that unique marriage of thunderous kicks and the most intelligent blips and beeps. The process of developing his harsher side and ultimately an album to highlight it began with a switch from London to Berlin. While one would be easily forgiven for assuming such a move was in hope of chasing the real ethos of underground techno in the place where it’s most widely celebrated, the producer’s explanation is a touch less glamorous (then again, there’s no real glamour with Berlin-style techno, is there?). Commitments in London held Blawan down for longer than he had intended and once a relationship there came to an end it was time to swap cities. Berlin offered a larger group of musical contacts and more affordable studio space. His sound now had room to grow exponentially, leading to easily one of the most well-received techno albums of the year. Questioned if whether the social differences between both cities have influenced his creative process, he was quick to point out that he doesn’t go out much, “It’s basically like I’ve just moved apartments, really”. While recounting his move from the UK to Germany, his tone is just about as straightforward as any of the eight tracks we were about to discuss, pointing out that he still plays the same clubs in London now that he did when he lived there, but his steely exterior creaks when he finally gets chatting about the album itself. Several of the biggest names in techno were on the receiving end of rave reviews from critics for albums that did deviate, some more so than others, away from sounds that we had come to expect from them on previous EPs. That deviation was typically a move towards easy-listening, rather than towards an even harsher techno sound, something Blawan doesn’t necessarily see the point in doing. The notion of an ID card is a useful one, despite the overarching feeling of giving in to the hyper-paced nature of today’s instant consumption market. However, Blawan has divided his sound into multiple, microcosmic aliases that all in turn have had their moment in the spotlight. Karenn, a side project alongside the newly Houndstooth-released Pariah was the most celebrated of all, with other sounds coming under the guises of Bored Young Adults and Kilner. Even with so many monikers, the Blawan objective has never stayed in one lane, something we see on ‘Wet Will Always Dry’. While alluding to the past few years the question of modular use crops up. Blawan’s latest record is made up of 100 per cent modular music, in acknowledging that he points out that if Jeff Mills were to drop an album next week, we wouldn’t refer to it as “100 per cent 909, would we?”. While laughing at his own joke and at the media’s never-ending hunger to slap labels on anything and everything, he shrugs off the question. “I’m a little bit wary about playing modular tracks because they can sound a little bit too raw and unpolished.” While Blawan’s sound has ebbed and flowed much more than most techno artists would ever dream of, one thing that has always remained consistent is his flawless live performances. His latest Irish outing saw him command two turntables at Life Festival’s Index stage as if they were a pair of CDJs stuck on sync mode. His legendary B2B with Sunil Sharpe goes down as one of the most iconic sets ever played at the festival. With such a cathartic approach to production and a chaotic sound at that, Blawan always keeps it smooth in the booth. The commitment to wax goes even further than the stage though, as he notes that the album is designed to be played on vinyl. Laughing for a minute at the fact that he took the time to cut each track to vinyl after making it, he goes on. “It takes a little bit longer alright. I’m just a nerd! Some people think it’s an old thing but I’m just clinging onto it with a tight grip. It’s extremely important, it’s where my real passion lies. I really like how vinyl changes the sound of music. The whole process behind it, the whole industry behind it, I think it’s worth supporting. There are a lot of people involved in it. In the midst of this passionate decree he interjects, pointing out that the whole process of making the album amounted to “about a month and a half I think” but that “it was every day in the studio, it obviously seems short but given how much time I spent on it every day it wasn’t”. 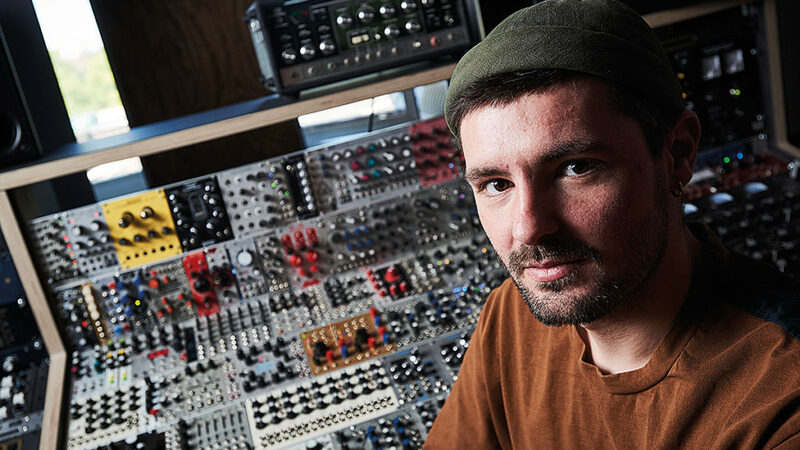 Right after putting the album together across the months of January and February, the Englishman proceeded to head back on the road for a series of club shows, something that allowed him to further harness his grip on what Blawan’s conclusive sound is, but also to test out the tracks he had in the environment they were created for. The most prominent stop on that tour was a step on arguably the world’s biggest mix platform. Blawan recalled to me how it felt to finally record a BBC Essential Mix. The Berlin-based artist’s sound has meandered through some of the most alien and exciting landscapes modern techno has ever heard, but never really found itself a home. In ‘Wet Will Always Dry’ we have a concise bookmark on the current embodiment of Blawan, but whether he will ever remain the same is something we should never bet on. From UK-entwined techno to more machine-driven, bleep- ridden club weapons and every alias and collaboration in between, Blawan has torn down a sonic wall we never knew existed. Why should we expect him to stand still now? 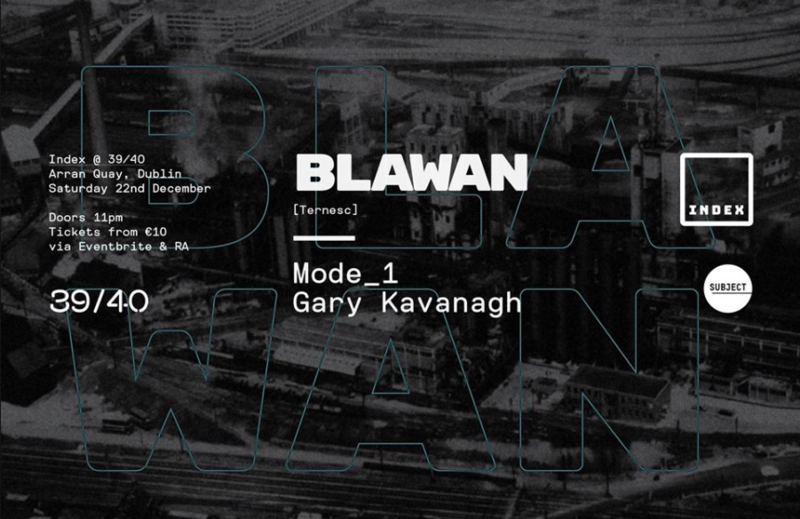 Blawan plays Index on December 22. Join the event page here and pick up tickets here.